This tiny USBG drive is indeed faster than many internal SATA drives. The new Samsung T3 and its predecessor, the T1, are the handiest and fastest USB SSDs on the market. Indeed, the T1 I’ve been using for the last year or so has saved me so much time moving data from PC to PC and installing software, I don’t know what I’d do without it (other than waste a lot of time). It’s far faster than anything else I’ve tried, and the thin, wide profile doesn’t make a lump in the pocket like the average thumb drive does. At 2.3-inches wide, 3-inches long, and 0.4-inches thick, the T3 is slightly larger than the T1, has a new luxurious velvety texture, and at 1.8 ounces, has a more reassuring heft. All nice improvements, but I was hoping for just a bit more on the technology front. 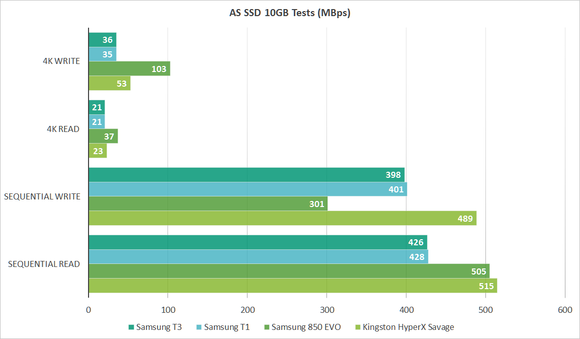 While the T3 is “USB 3.1” and has a USB-C port, I harbored fantasies that it might be a full-on SuperSpeed+ 10Gbps implementation, not the USB 3.1 Gen 1 SuperSpeed 5Gbps that we’ve grown bored with. Well, it’s not. And yes, I said it. Bored. Like record seekers on the Bonneville salt flats, we’ve acquired a need for more speed. Jonesin’ man! Gotta have it! The T3 has a USB Type-C connector and comes with a non-captive Type-C-to-USB-3.x-Type-A cable. OK, I’m back now, so I can tell you that aside from feeling more expensive than the T1 (which it’s not), the T3 is an even better performer, especially with smaller files and folders. The T3 is based on Samsung’s TLC NAND and uses a more refined version of the MGX controller found in the T1. However, the speed improvements may be due to the now-optional encryption that we left turned off. Full-time encryption or no, the T1 and T3 are the only drives I’m aware of that take full advantage of Gen 1 SuperSpeed USB, though that also depends on what grade of USB port you attach it to. If the T3 is attached to a USB port that features UASP then you can theoretically see up to 450MBps each way. That’s internal SATA SSD territory. Hot-digg-ity-dog. On a normal USB 3.x bus that will dip to around 350MBps (ironic sigh), and, of course, drop all the way down to around 50MBps via USB 2.0. Sincere sigh. By the way, UASP stands for “USB attached SCSI Protocol.” If you spell it all out, you get “Universal Serial Bus attached Small Computer System Interface.” I’ll stick with UASP. In out tests, the T3 didn’t reach its theoretical maximums (few drives do), but it was darn close, as you can see in the charts below. Though not shown, on a non-UASP USB 3.0 port, transfers were almost exactly 300MBps each way. 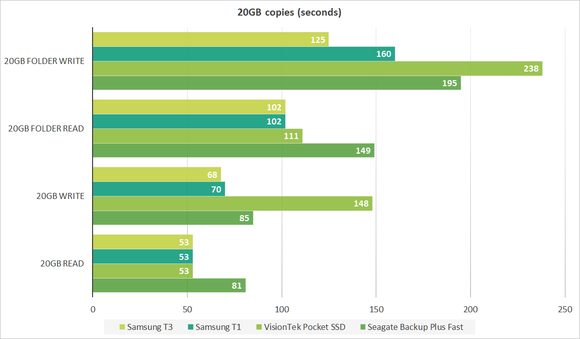 The numbers below reflect NTFS performance. 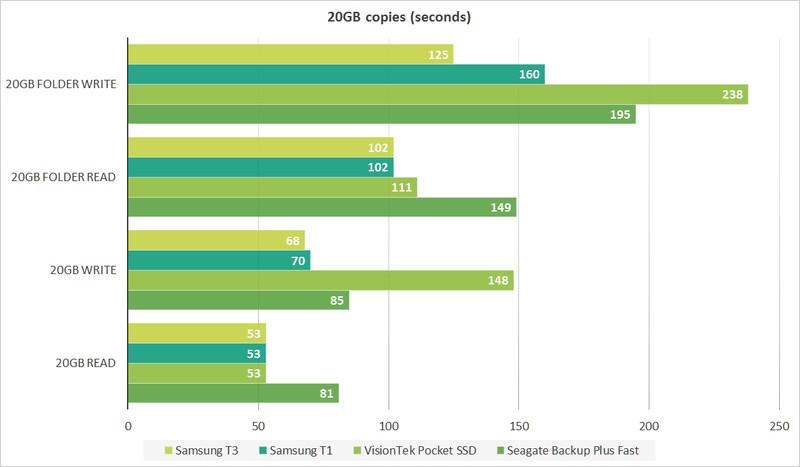 AS SSD rated the T3 as only marginally faster than the T1, but check out the copy times for files and folders below. The T3 proved quite a bit faster than the T1 with our 20GB set of files and folders. Where the T3 seems greatly improved is in its handling of large batches of smaller files. Its large-file copy times were nearly the same as the T1, but thanks either to the improved controller or the disabled encryption, it hacked quite a few seconds off the T1’s time with our 20GB batch of files and folders. It’s fast. 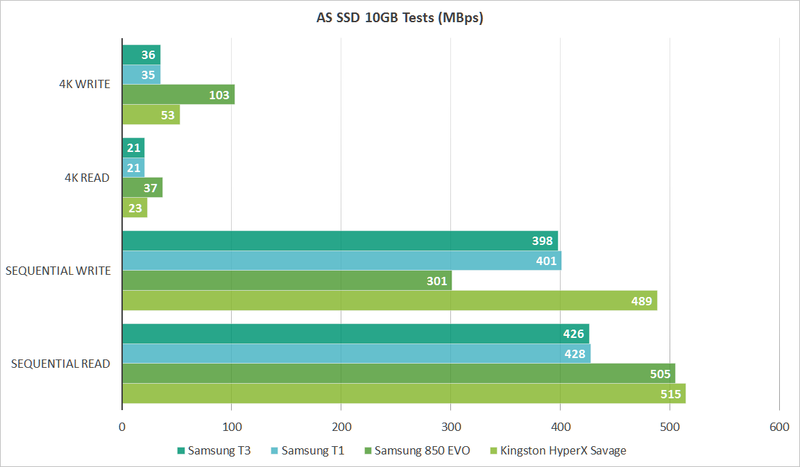 Fast enough that it doesn’t look completely mismatched against the Samsung 850 EVO or Kingston HyperX Savage, internal SATA 6Gbps drives in the chart above. But still... where’s the SuperSpeed+? The T3 is also enterprise/security friendly. 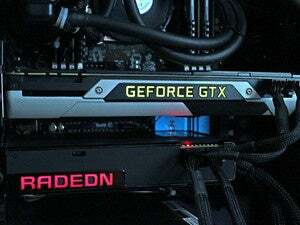 You can password-protect it with full 256-bit AES encryption, which is now optional, and not full-time as with the T1 (which again, may account for its faster times with files and folders). Said password is set via a utility provided with the drive, or with an Android app. (Sorry, iOS fans). There’s no FIPS 140 certification because there is relatively easy access to the hardware, but it’s as secure as can be short of that. The T3 isn’t super cheap, but it’s also not as pricey as you might suppose—just a tad over 40 cents per gigabyte once you get past the 250GB model. Specifically: The 250GB version is $130; the 500GB model is $220; the 1TB, $430; and the 2TB, $850. Yes, that’s a lot of dough compared to a hard drive, but the T3 is potentially three times faster, super shock-resistant (no moving parts), and dead quiet. And, it’s only 10 cents more per gigabyte than current bargain SATA SSDs. 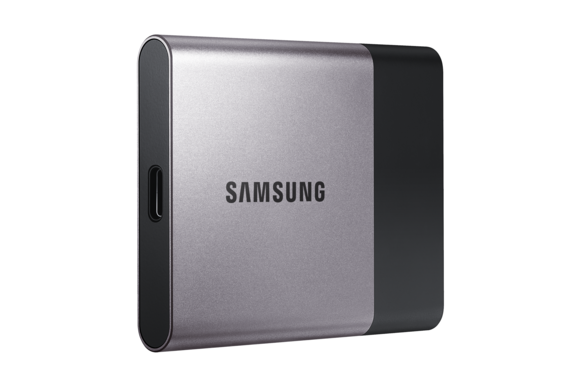 The T3 carries a three-year warranty but Samsung didn’t publish a TBW (TeraBytes that can be Written) rating. 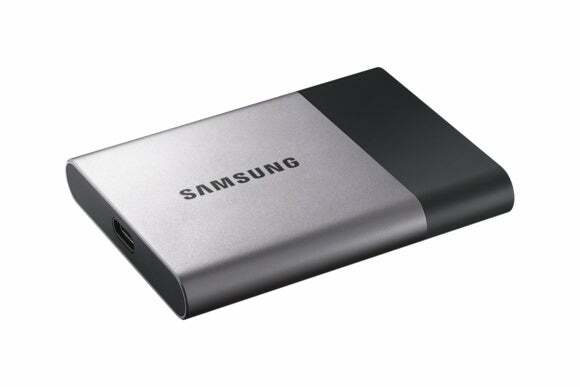 Given what I know about Samsung’s TLC NAND, and most importantly, the fact that you won’t be writing constantly to the drive as you would an internal SSD, I’d expect a decade of use at the very least. Most people aren’t used to the kind of USB storage performance the T3 can deliver. Really. So no matter what you do, don’t buy a T3 (or a T1). Speed addiction is a scary thing. Seriously, if you buy a T3 and find yourself harboring a sudden urge to burn salt in Utah with a jet car, don’t blame me.